One more thing: Once, when I was standing around on the set one day, whining about something ―― you know we were gonna work through supper or the long hours or whatever, Tommy Lee Jones said to me, “Isn’t it such a privilege, Meryl, just to be an actor?” Yeah, it is, and we have to remind each other of the privilege and the responsibility of the act of empathy. We should all be proud of the work Hollywood honors here tonight. 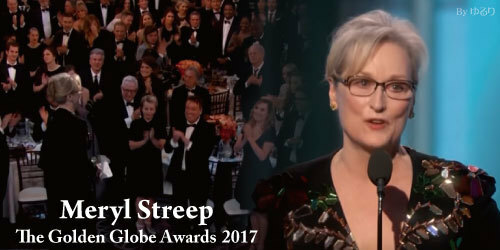 ①トミー・リー・ジョーンズ：Isn’t it such a privilege, Meryl, just to be an actor? ②キャリー・フィッシャー：Take your broken heart, make it into art. Isn’t it such a privilege, Meryl, just to be an actor? わかりにくくしているものを取って、見やすくすると　it is [not] a privilege to be an actor?